Our mixed-age classes create a family feel, and give children a chance to learn from – and teach – each other. Mixed-Age classes give every child a chance to participate at exactly the level that’s comfortable for them. And families love our mixed-age classes because siblings can play together in the same class. The Music Together® curriculum is designed to meet the needs of a broad range of ages and abilities. 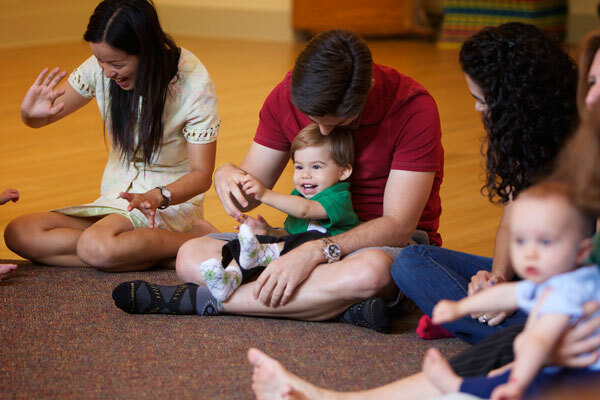 Six to twelve children, their parents or caregivers, and class teacher gather in an informal circle to sing, play, enjoy movement games, and explore instruments together. The relaxed atmosphere helps everyone learn - children learn basic music skills, and grownups learn ways to share music fun with their children at home as well as in class. Children are free to participate, watch, or leave the circle and move around the room. We know that children who appear not to be paying attention are really learning in their own way, and will often repeat class activities perfectly once they're at home. Every class features a mix of songs, chants, rhythm and tonal play, movement games, and music exploration with simple musical instruments. Some activities are guided, and some feature free improvisation and exploration. Classes flow from quiet activities to all-out “shake-your-body” fun, and always end with a quiet lullaby and ritual goodbye song. Click to listen to some Music Together songs.